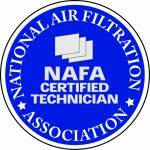 The NAFA Certified Technician (NCT) Program was first introduced to NAFA members in January 1999 as an effort to add more credibility and professionalism to the air filtration industry. Since its introduction, nearly 300 air filter service technicians have taken the 100 question, open-book exam based on the NAFA Installation, Operation, and Maintenance of Air Filtration Systems manual. Almost immediately after the program became available, interest started growing to make this program available to a much wider audience than just the NAFA membership. 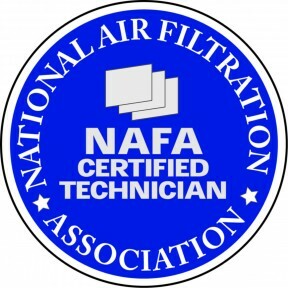 NAFA members, in particular those who are Certified Air Filter Specialists (CAFS), saw the NCT program as an opportunity to spread knowledge and professionalism to technicians they encountered in the workplace who might not otherwise be involved in NAFA. The chance to reach facility managers and building owners by certifying their employees also means promoting NAFA as an organization on a much broader scale than in the past. As stated in the Certification Policies and Procedures, a CAFS must administer the NCT examination to exam candidates. Now that the program is available to non-members who will not have CAFS on staff, current NAFA CAFS will have the opportunity to more thoroughly train current customers, and perhaps even to reach new customers and further their own business, by serving as the link between NAFA certification and the service technician. Candidates who score at least a 70% on the exam are presented with a certificate from NAFA Headquarters as well as two NCT patches. Certification requires only one continuing education credit each year for annual renewal, as well as completion of the renewal application and payment of the renewal fee. Contact NAFA Headquarters at (608) 310-7542 or by email at nafa@nafahq.org if you are interested in becoming certified, or if you are a CAFS who is interested in administering the exam to service technicians you encounter in the workplace. NAFA continues to strive to educate and add professionalism to the industry, and we hope you will join with us in this mission. What do I need to study in order to pass the NAFA Certified Technician exam? The 100 question (50 multiple choice, 50 true/false) NCT Exam is based on the Installation, Operation and Maintenance of Air Filtration Systems, 3rd edition. It is an 2-hour, open book exam. What is the Cost to take the exam? For members, the cost to take the exam is $75.00; to renew certification each year, the cost is $30.00. For nonmembers of NAFA, the cost to take the exam is $150.00; to renew certification each year, the cost is $40.00. Attended an in-house training seminar presented by a CAFS related to HVAC, IAQ or filtration. When / Where can I take the exam next? The next NCT Exam will be administered at during the next Annual Convention, AHR Expo and Technical Seminar, or you can take the exam online. What about the tutorial? At this time, there is no tutorial for the NCT exam offered at the conferences. Are there any other options? Any NAFA CAFS can administer the exam. If you are interested, contact your NAFA Representative, or NAFA Staff at 608.310.7542.